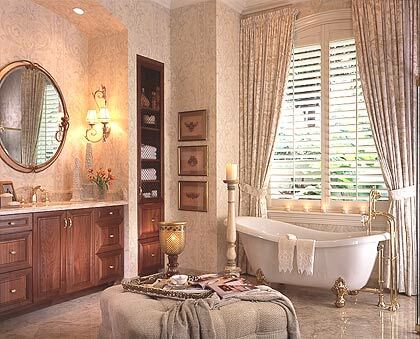 This romantic bathroom retreat at Hawk's Landing features an old-fashioned bathtub that overlooks a private garden. Custom walnut cabinetry mimicking fine funiture satisfies the "warm and inviting" requirement in the 15-by-15-square-foot bathroom. Then there's the tub: Perched on gold-finished claw feet, it overlooks a colorful garden. Indonesian royal oyster marble flooring, characterized by shades of gold, gray and brown, complements the dark walnut of the vanity table, while a combination of paper and faux painting enlivens the walls.